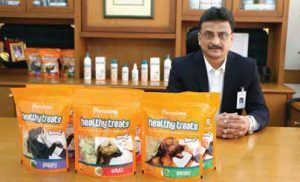 The Himalaya Drug Company, one of India’s leading home-grown wellness brands, has forayed into the pet nutrition category with the launch of healthytreats. Healthytreats are nutritious herbal snacks available in three different variants for puppies, adults and senior dogs to address their health needs. These treats cater to specific requirements of pets at each stages of their life. Speaking about the launch, Neti Patel, general manager-Animal Health Division, The Himalaya Drug Company, said. “In India, pet nutrition is a niche segment that offers great opportunities. Currently, the market size of pet nutrition stands at over Rs 700 crore and is growing at a rate of 20 percent. Having been the top herbal player in this category, launch of healthytreats is a natural extension to our wide range of pet grooming and wellness products.” Himalaya’s rich expertise in the animal health division for over the last 17 years helps the company understand the importance of pet’s well-being. This is the next step for Himalaya’s animal health division, which aims to provide well researched herbal solutions for pets. “We connects with pet parents primarily through vets along with other channels like pet shops, grooming parlours, modern retail outlets, trade channel and others, for their grooming and wellness needs,” asserted Neti Patel, adding that by the end of 2017 they are looking at reaching out to over 3500 pet practitioners across India, while introducing few more products under this category. Healthytreats provide nutrition and special health benefits due to the presence of herbal actives. Healthytreats Puppy (0-2years) supports digestion and immunity; Adult (2-7 years) supports skin health and promotes overall fitness; and Senior (7 years and above) supports join health and control stress. The snacks are now available across major retail channels, pet stores, Himalaya Outlets, himalayastore.com and Himalaya app.